Ask any couple planning their wedding, and perhaps none would describe it as "chill". Meet the couple who wanted exactly that, and got it - Jiayi and Amos. This pair of fun-loving lovebirds kept their celebration down-to-earth by doing away with a lavish banquet, and planned in its place, a simple wedding dinner at local cafe, Food For Thought, with their closest loved ones. 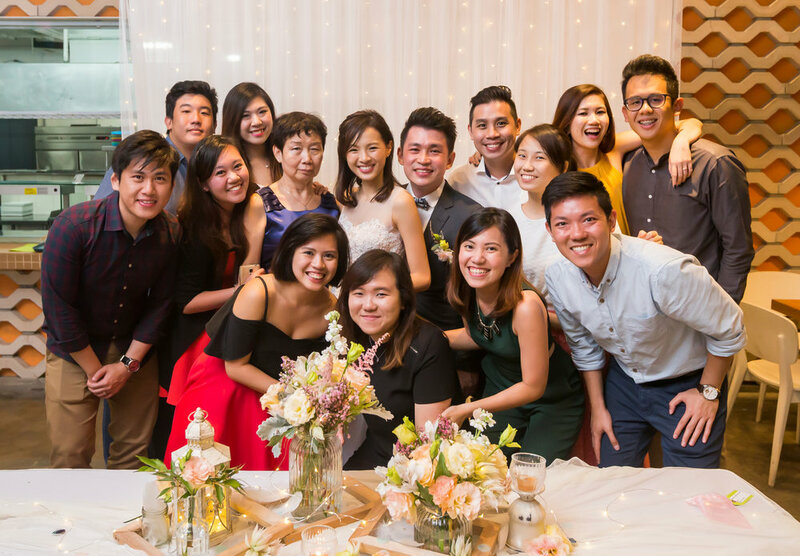 Whether it was cheeky coincidence or just staying true to making their wedding "chill", Jiayi and Amos made well sure that their big day did not begin at "ungodly hours". 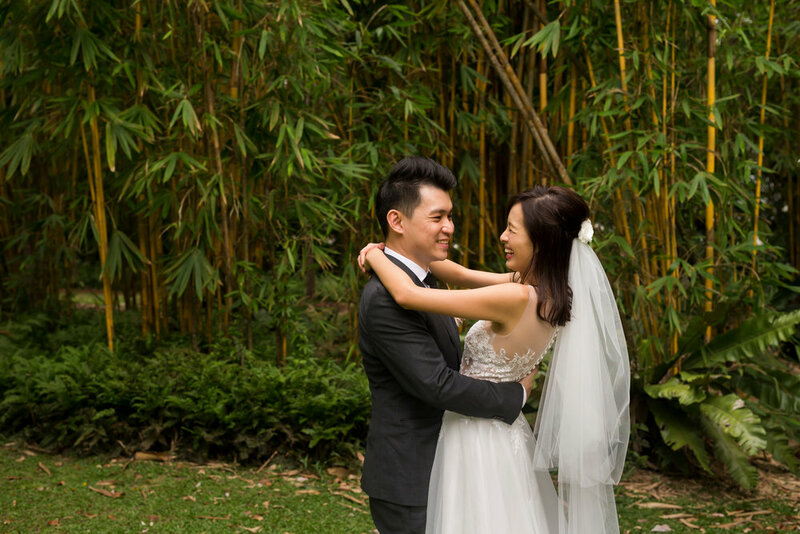 Every bride dreams of a beautiful gown for her big day, and Jiayi was no exception; but the bubbly bride herself knew exactly what she wanted. We fitted Jiayi with an off-the-rack illusion lace top gown, complete with a light organza skirt. While we let the organza skirt do the talking on its own, we adorned Jiayi's illusion top with intricate French lace to keep things romantic and ethereal. Her wedding gown features a mix of both chantilly and corded lace; chantilly for a dainty touch, and corded to create three dimensional textures, allowing the illusion top to stand out. Jiayi requested for something that allowed her to walk around at her usual casual speed, without having to worry about tripping or tearing the dress. Naturally, an A-line dress came to mind, and an illusion top gave her added comfort, without leaving out the details. With that, our bride was ready to enjoy herself thoroughly throughout the day. Jiayi and Amos's plan to make it a relaxed affair was possible as they roped in the help of their loved ones. 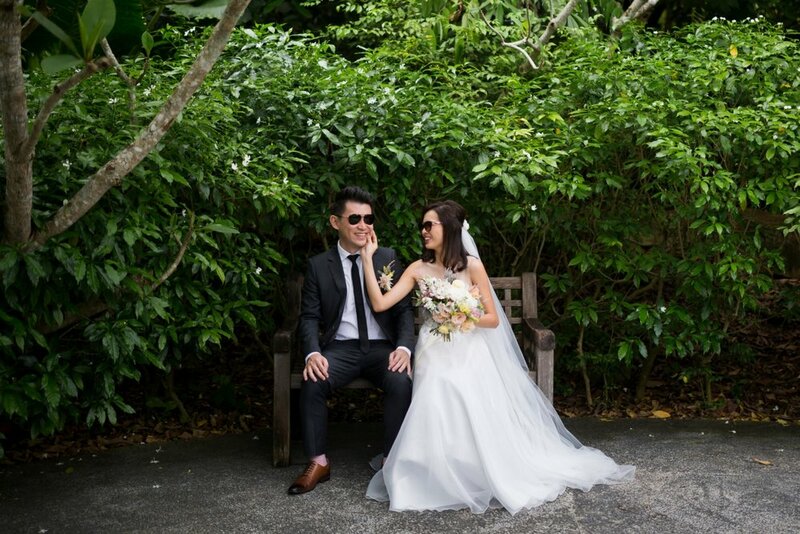 While they spruced Food For Thought up with plenty of DIY and TLC, Jiayi and Amos were able to sneak away for a little pre-dinner shoot in the deeper sanctuaries of Singapore Botanical Gardens. Jiayi's illusion top gown was adorned with an intricate mix of French lace; chantilly for a dainty touch, and corded to create three dimensional textures. With their friends and family taking care of the little details, the couple truly had a worry-free wedding. Finally, our Amanda Lee Weddings designer and long-time friend of the bride, Pearlyn, had the honour of blessing and dressing Jiayi for her big day. We got Jiayi to share a few thoughts on her experience.